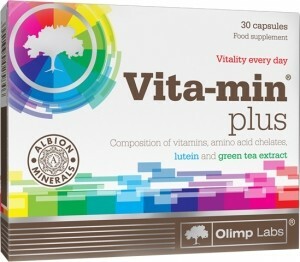 Olimp Vita-Min Plus is a food supplement containing a complex composition of vitamins and easily absorbed mineral components in the form of chelates**. The product is enriched with LUTEIN and with GREEN TEA extract. Ingredients: minerals (calcium carbonate, magnesium bisglycinate**, magnesium oxide, calcium bisglycinate**, potassium chloride, zinc bisglycinate**, manganese bisglycinate**, ferrous bisglycinate** (Ferrochel®), copper bisglycinate**, sodium selenite, chromium (III) chloride, potassium iodide), vitamins (L-ascorbic acid - vitamin C, dl-alpha-tocopheryl acetate - vitamin E, nicotinamide - niacin, D-biotin, retinyl acetate – vitamin A, calcium D-pantothenate – pantothenic acid, pyridoxine hydrochloride – vitamin B6, cholecalciferol – vitamin D, pteroylmonoglutamic acid – folate, thiamin mononitrate – vitamin B1, riboflavin – vitamin B2, cyanocobalamin - vitamin B12) green tea extract (Camellia sinensis L.), lutein, microcrystalline cellulose (bulking agent), magnesium stearate (anti-caking agent), capsule (gelatin, colour: E 171). 1 capsule daily after the meal or otherwise after consultation with your physician.